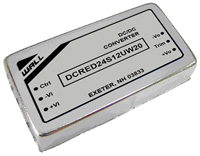 The DCREDUW20 series of DC/DC power converters provides up to 20 Watts of output power in an industry standard 2.00” x 1.00” x 0.40” package and footprint. This series has single and dual output models with 4:1 ultra wide input voltage ranges of 9-36VDC, 18-75VDC, and 43-160VDC. Some features include high efficiency, 1600VDC I/O isolation, six-sided shielding, and positive logic remote ON/OFF. These converters are also protected against over voltage, over current, and short circuit conditions. All models are RoHS compliant and have UL60950-1, EN60950-1, and IEC60950-1, and EN50155 safety approvals (pending). This series is best suited for use in wireless networks, telecom/datacom, measurement equipment, industry control systems, semiconductor equipment, and railway systems. 2. Typical value at nominal input voltage and no load. 3. Typical value at nominal input voltage and full load. 4. Test by minimum Vin and constant resistive load. 5. Trimming allows the user to increase or decrease the output voltage set point of the module. This is accomplished by connecting an external resistor between the TRIM pin and either the +Vout pin or the –Vout pin. 6. The ON/OFF control pin voltage is reference to –Vin. Positive Logic comes standard and to order negative logic remote on/off add the suffix “R” to the model number. These converters can meet the railway T2 and TX temperature requirements. 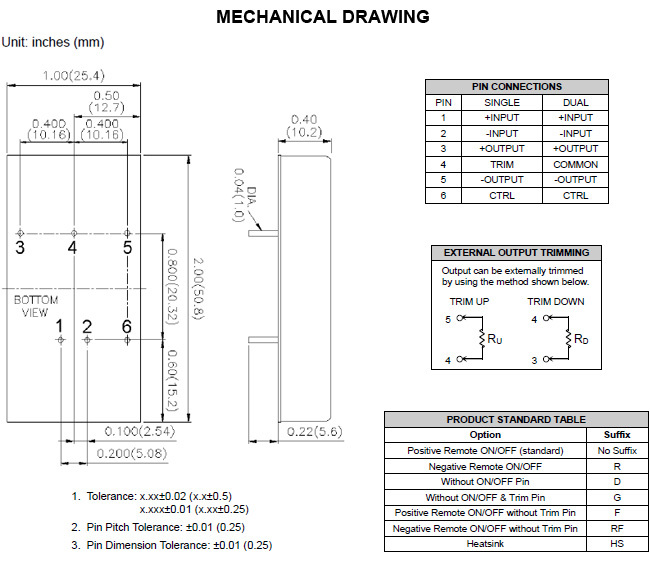 T2: -40°C to +70°C for all models, TX: -40°C to +85 with power derating to 55% output power. (With heatsink the power derates to 70% output power). Test conditions with vertical direction by natural convection (20LFM). 8. Heatsink is optional and P/N: 7G-0020C-F. See “Product Standard Table” on page 5 for ordering information. 1) 24Vin and 48Vin Models: To meet Class B the modules do not need an external filter. 2) 110Vin Models: To meet Class A the modules do not need an external filter. 10. An external input filter capacitor is required if the module has to meet EN61000-4-4 and EN61000-4-5. The filter capacitor suggested for 24Vin and 48Vin models is Nippon chemi-con KY series, 220μF /100V, ESR 48mΩ. The filter capacitor suggested for 110Vin models is Rubycon BXF series, 100μF /250V. 11. There are several different options available for this series. Please see the “Product Standard Table” on page 4 for all options and ordering information.